Our Happy Bellies are the perfect first solid foods for your baby. They are the first baby cereals with probiotics for digestive system health and the only organic cereal with DHA and Choline to support brain and eye health. Our Happy Bellies cereals are certified organic. 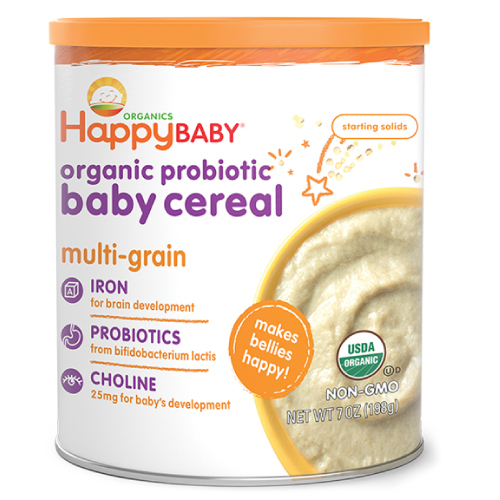 Happy Bellies Multigrain Baby Cereal is perfect for babies who are ready to move beyond brown rice cereal, as it contains new grains like oats, amaranth, and quinoa. It is enriched with DHA and Choline for brain and eye development and has pre and probiotics for Baby’s immune system support. Our Multigrain cereal is perfect for babies ready to move beyond rice cereal. Happy Bellies cereals are easily digestible and gentle for those precious first bites. DHA and Choline to support brain and eye health. Iron, vitamins and minerals that are important for baby's growth. Probiotics for digestive system health: good bacteria specially formulated to help your baby's digestive system. Probiotics help in maintaining a healthy bacterial balance in the GI tract. Pour desired amount of cereal into bowl. Add liquid of choice (breast milk, formula or water all work fine). Mix until it's the right thickness for baby. Feed your baby right away. Throw away any leftovers. Use 4 tbsps of liquid for every 1 tbsp of dry cereal. Increase portion as baby grows. Add some of happy baby's puréed fruits (like Mango or Pear) for even more flavor.